1:30 p.m.​ - 2:30 p.m. Artist Talk: Edward Burtynsky in conversation with Darcy Killeen, Executive Director, Scotiabank CONTACT Photography Festival. 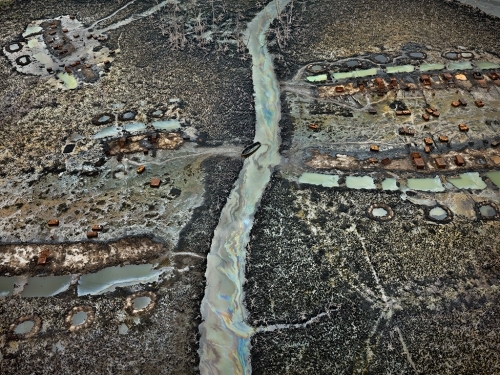 Photographer and CONTACT board member Edward Burtynsky discusses his largest project to date, which combines art, film, virtual and augmented reality, and scientific research. Anthropocene, with longtime collaborators Jennifer Baichwal and Nicholas de Pencier, investigates the irreversible impact of human influence on the Earth’s systems. The project will be released in Fall 2018 with new prints; two complementary museum exhibitions opening at the Art Gallery of Ontario and the National Gallery of Canada; a feature length documentary film; an educational program; and a book published by Steidl. The Photography Show, presented by AIPAD, brings together prominent curators, collectors, artists, and journalists to discuss the current climate in photography. This year, the discussions explores some of the most challenging topics affecting our world, highlighting how the dynamic medium of photography is making a difference. Eleven AIPAD Talks, entitled Photography Talking Back, will present photographers who are on the front lines of issues ranging from immigration, racism, and climate change to gender inequality and the rise of “fake news.” Thought-provoking images are starting conversations, changing perceptions, and inspiring action. AIPAD Talks require separate admission and tickets are available for purchase online and at the door. Seating is limited.